of 'squashed bucket' form, Stourbridge c.1901. 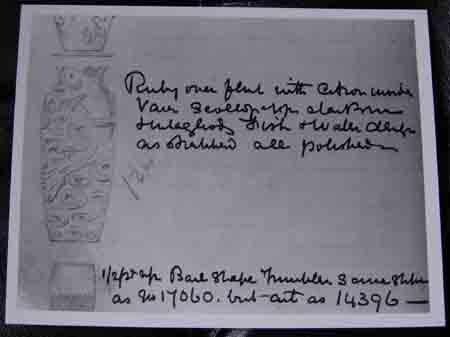 of lily bud form striated with green, signed and dated 1901, Stourbridge, 11 1/4in (28cm). 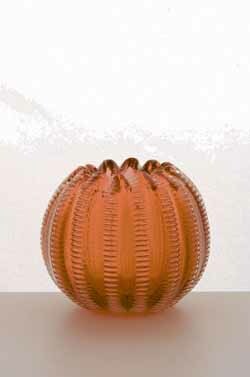 for a similar vase see Paul V Gardner, The Glass of Frederick Carder, Crown Publishers Inc, New York, 1976, p.g. 15, pl iii.22. Stevens and Williams Pattern Books, Broadfield House Museum, Dudley. 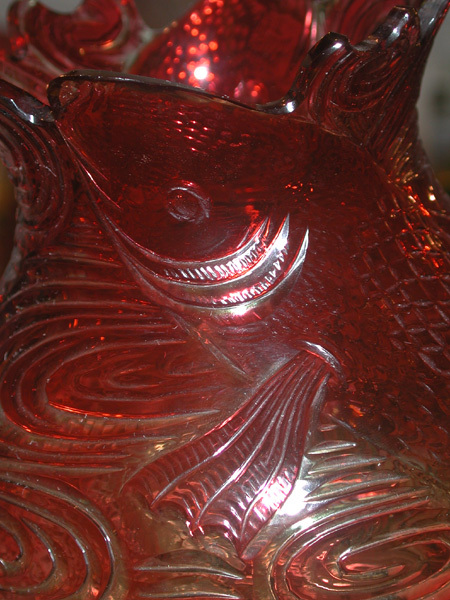 A Detail of the fish cutting on the Frederick Carder fish Vase. 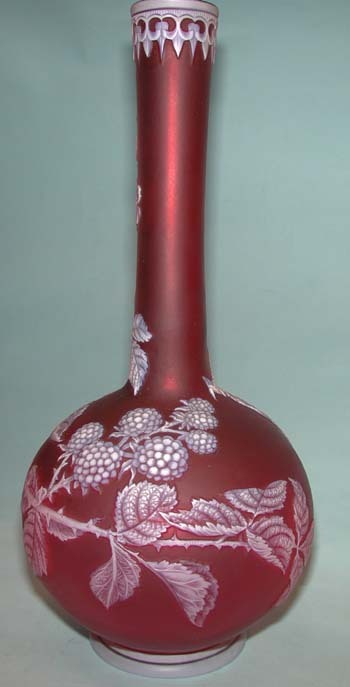 of bottle form, the white cut to cranberry with fruiting black berry canes, Stourbridge, c.1885, 11in (28cm) approx. 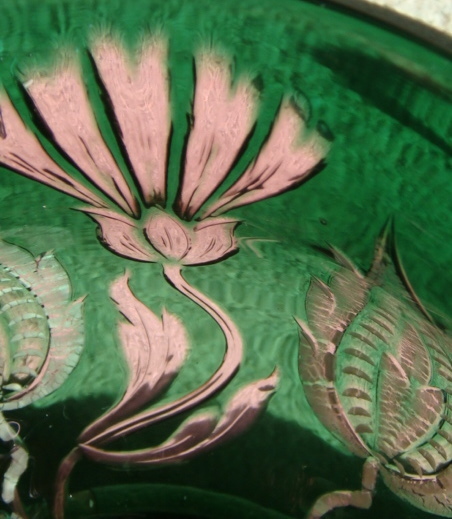 the green overlay intaglio cut to clear, the silver mount hallmarked for Birmingahm 1898 and made by Heath and Middleton, 11in (27.5cm). 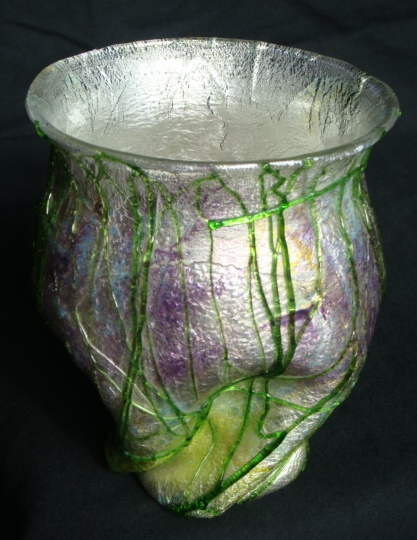 the purple overlay intaglio cut to clear, the silver mount hallmarked for Birmingahm 1898 and made by Heath and Middleton. 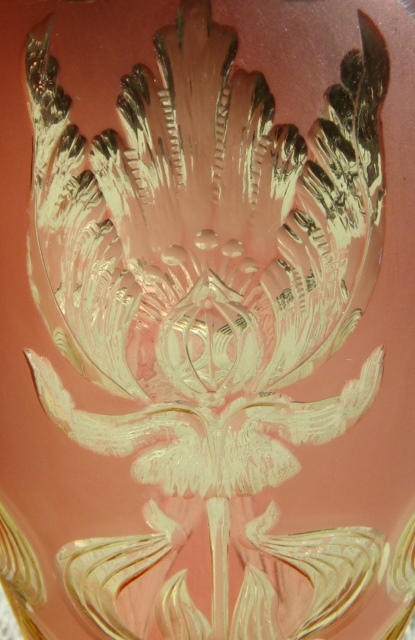 of baluster form, cranberry/orange cut to clear with an English Art Nouveau style Tulip flower, 12in (30.5cm). 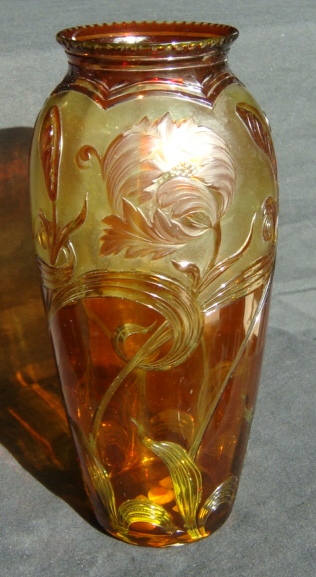 Detail of the cutting on the Stevens and Williams English Art Nouveau Vase. 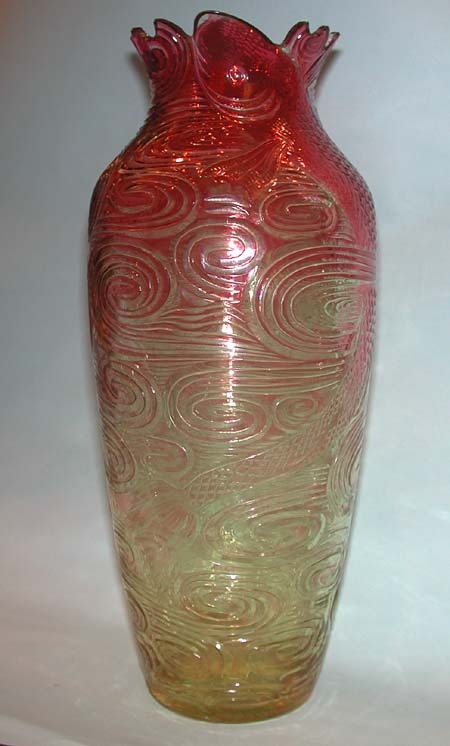 Stourbridge, c.1890, 14 1/2in (37cm) tall approx. 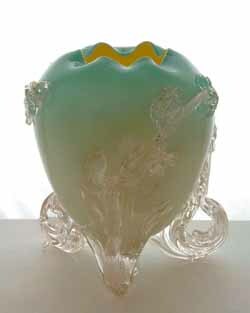 of double gourd shape, the case body intaglio cut with air trapped adventurine motifs of flowers, Stourbridge, c.1895-1905, 12in (30.5cm) high approx. 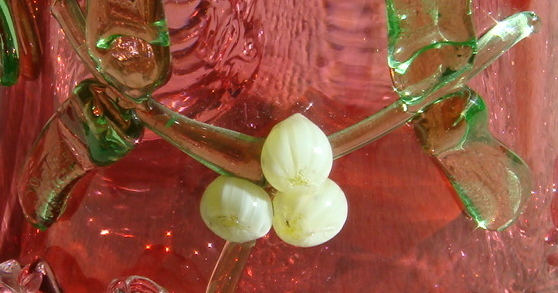 A detail from the Adventurine glass vase decoration. of globular form the air trap body divided into stipes beneath a wavy rim, Regisitered Design Number - Rd 66953, Stourbridge, 1880's 3in (7.5cm) high, approx. cased and intaglio cut, circa 1909, 29cm high. 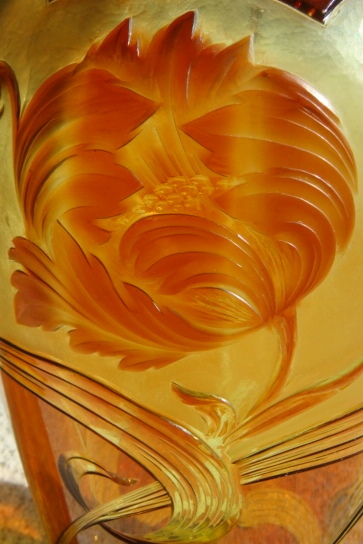 A Detail from the Joshua Hodgetts cut vase. 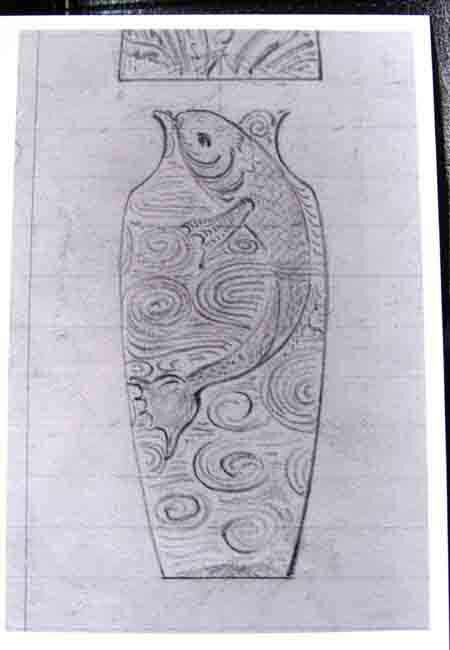 of moon flask form, the pink cut to white with chicks and wheatears. 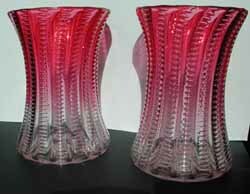 The Victoria & Albert Glass Collection holds an identical piece. Stourbridge, c.1885, 14in (35cm) approx. 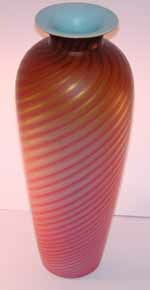 of waisted cylindrical form, graduated colour of cranberry to clear, c.1885, 5 1/2in (14cm) high approx. 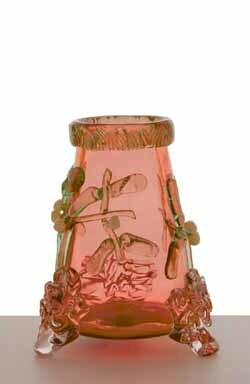 the cranberry body aspplied with mistletoe sprigs, the base with raspberry prunts, 7in (18cm) high approx.